Cape Town’s Day Zero threat to change landscaping habits? As dam levels in the Western Cape hover at around 20 percent, the water crisis in the Eastern Cape deepens and KwaZulu-Natal continues with its own water restrictions, home owners and businesses need to completely rethink their lifestyles and water usage habits for the long term, according to Herve (Trigger)Truniger, the national accounts manager for Easigrass South Africa. As one of the Western Cape residents counting down to day zero when the taps run dry in the Mother City, he believes that South Africans will never look at water the same way again. As day zero looms, residents have been urged to reduce their water usage from the already low 50 litres (13 gallons) of water per person, per day in an effort to secure what little reserves are left. According to Truniger, in contrast, the average American uses 378 litres of water per day. That means 90 second showers, one toilet flush, one tooth brushing and two bottles of water to drink for Capetonians. Their US counterparts can indulge in 20 minute showers, flush the loo five times, brush their teeth at least twice and drink a minimum of five bottles of water. Even in Canada and Europe, people are using eight times as much water has those living in Cape Town. There’s no mention of luxuries like landscaping and gardening. Yet, he believes it’s still possible to enjoy living in a beautiful urban environment in a water scarce country – provided that gardeners realise that there could be further day zeros to come if they don’t change their habits. “We believe that drought friendly landscaping is critical when it comes to saving water. Many municipalities are still imposing stringent water restrictions with massive penalties for those overstepping their water usage allowances. In Cape Town, we have already been told to prepare for similar water constraints next summer, especially if there is not adequate winter rainfall. Droughts are cyclical and, in a country where water is in short supply and the population is growing, dry periods are likely to return more and more often,” he warns. He admits that it has been alarming to watch lawns and plants dying and looks forward to both homeowners and businesses being able to replant and restore green areas. “However, in the green space, landscapers and homeowners must seek alternatives such as laying artificial turf rather than replanting water guzzling lawns which they will need to replant again and again as droughts return. 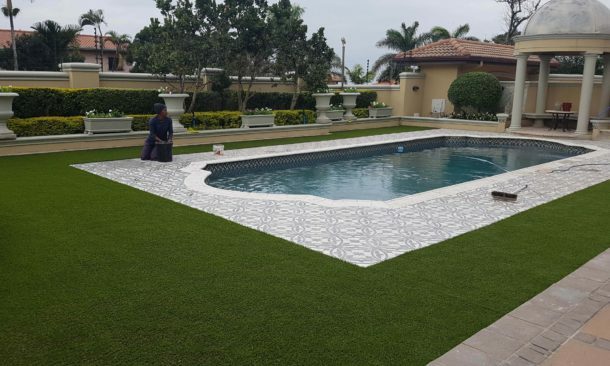 Artificial grass is not only aesthetically pleasing but means you can keep pace with inevitable water tariff increases, reduce overall garden maintenance costs whilst still saving water. It’s a win win,” he says. Easigrass, the world’s leading artificial grass brand, is based in the United Kingdom and has been researching, developing and designing artificial grass for over 30 years. Recognized by horticultural and design associations across the world, it’s the geo-friendly alternative for gardens, playgrounds, sports facilities, balconies, rooftops, pools or interiors. On home soil, Easigrass is backed by Van Dyck Floors which applies the same high international standards when it comes to quality, design excellence, product back up and guarantees. Because European and South African grasses are completely different, Easigrass South Africa has researched, designed and launched nine artificial grasses that resemble popular local varieties. This means that Easigrass blends with indigenous and drought tolerant plants to produce attractive contemporary outdoor areas. Although switching to Easigrass means an upfront investment, this will quickly be offset by reduced water bills and savings on garden services, mowing, fertilisers and weed killers. It will also ultimately provide safe and healthy areas for pets and children to play whilst improving drainage and layout of your garden. Easigrass is fully perforated and, if installed with the correct base work, the water will drain through and penetrate the soil through the crusher dust base which is made from organic material and compacted. Easigrass is also fully recyclable. “Your Easigrass investment, if installed correctly, will last you 15 to20 years. Two years ago, breakeven was within four to five years. The current water tariffs have upped this period to just one to two years,” explains Truniger. · Rather than wasting water on lawn, rather keep precious supplies for your shrubs and trees , this in turn helps the birds and the bees. · Use river pebbles and rock under shrubs and trees to stave off the heat and keep the ground damp. There are great advantages in using pebbles or rock as opposed to normal mulch which absorbs a huge percentage of your precious water. · Water at the stem of the plant. · Rainwater and grey water harvesting is now a must. When you do not have to water your garden at all, your harvested rainwater and grey water will go a long way. Harvested rainwater can also be used to clean patios and outdoor areas. · Add a filter to your rainwater system and run it over dripline irrigation. This is the best form of irrigations as there is no water wastage and it sits underneath the mulch / pebbles / rock in your garden. · Try not to use brick paving or bitumen surfaces as they are often harsh and hot. Rainwater flows away as it cannot seep into the soil beneath. · Pots remain a great element to add to your garden as they retain water and nutrients very well. Prepare pots correctly. Use pre-fertilised potting soil, in your pots knowing that the nutrients will not leech away as when used open soil. Use pebbles on top to retain the moisture. Three or four large pots, planted with colour, will quickly brighten up your garden. · When planting new plants add products that absorb water, such as hydrogel, to your soil. This will absorb the water and release it over time. · Use boreholes and well points sparingly. The next trend will be to use this water as drinking water. There is however, not an infinite supply through these sources. · When choosing plants always be water wise. Although it is good to look for indigenous plants, they are not always water wise. Therefore, be vigilant when making your plant choses. Aloes and succulents have become hugely popular. Mixed with water boulders and water wise trees this combination can create a lovely garden. For more information, contact your closest Easigrass branch, log on to www.easigrass.co.za or contact us via email on sales@easigrass.co.za.